Give yourself plenty of time. Six months is a good starting point. The more time you have the more flexibility you’ll have to chose the dates your telecom services will be activated and deactivated. Know your contract dates and be on the look out for an auto renew. Ideally, your contract expiration date would coincide with your move date. That would offer the most flexibility. Make sure you don’t miss the deadline to cancel an auto renew. If your contract includes an auto renew and you miss the deadline to notify your carrier that you don’t wish to re up your service, you’ll be on the hook for another term and lose your flexibility. Before you sign a lease, determine what services are available at a prospective location. Broadband isn’t available everywhere. There are pockets in every major city where businesses can’t receive the local phone or cable companies’ services. Where other businesses are experiencing 50 to 200 Mbps of bandwidth, these businesses are reliant on unreliable microwave connections or expensive T1. And property managers won’t tip you off. Buyer beware: the absence of broadband is not something a property manager or commercial leasing agent is required to disclose. Your current carrier won’t allow you out of your contract if you move to a building they can’t service. If you’re one year in and need to move and chose a location your current carrier can’t service, you’re most likely looking at a termination penalty of monthly reoccurring cost x number of months remaining on your agreement. Do your homework and plan ahead. If you sign a lease before discovering this information, you’ll be on the hook for your carrier’s termination liability or whatever the penalty is to break the lease. Involve your IT and Telephone System Vendors early on. It’s likely that you’ll need cabling installed at your new location. Your phone vendor can complete the work that will support both your phone system and computer network. Your phone vendor might need to extend the phone company’s demarc and work with your telephone service provider to port your phone numbers. Don’t assume that your current phone numbers will work at your new location. Planning ahead will give you time to work out these issues ahead of time. When time is compressed it reduces your options and flexibility. Don’t assume another business’s phone equipment or service. If you’re moving into a site that another company is vacating and they offer their current services or equipment to you, remember they’re probably doing so because they face termination liability or are unhappy with the equipment or services. Not all telephone and internet service and equipment is of equal quality. It’s better to find services that are right for your business versus accepting some other company’s leftovers. 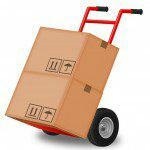 When you’re involved with a business move, there is so much to think of and consider. Getting through a move will make you never want to move again. Let the professionals at CarrierBid take your telecom and internet services, phone and computer equipment off your plate. CarrierBid can help you with every element of your technology. If you’re planning on a future move, please contact CarrierBid today or complete the web form on the right side of this page.